Rockapella, a five-piece American a cappella group that formed in 1986 in New York City, will be coming to the Zeiterion Theatre in New Bedford, Mass., this Sunday, Feb. 10 for “Motown and More,” a show featuring songs from their upcoming album of the same name. Scott Leonard, the group’s primary songwriter, arranger and high tenor, said he anticipates the album will be available in the next few months, and that the show, which begins at 7 p.m., pays tribute to the music of Motown with one-of-a-kind versions of hits from his all-time favorites such as The Jackson 5, Stevie Wonder, and more. Leonard started singing in male groups in college, and joined the group in 1991. He said Rockapella has evolved through the years, as they’ve added a lot more staging, technology and choreography to the mix. None of the founding members are still in the band, but as each of them retired, said Leonard, they were able to strengthen the group, as they handpicked replacements they were looking for. Aside from Leonard, the current line-up also features bass vocalist George Baldi III, tenors John K. Brown and Steven Dorian, plus vocal percussionist Jeff Thacher. Of Thatcher, Leonard said he’s basically a human drum set. To keep their voices in “remarkable” condition, Leonard said he drinks a lot of water. Unlike other vocalists who are backed by bands, there are no musical breaks or gaps in a cappella, so their vocal chords get little rest during performances. Keeping a healthy cardiovascular system, plus a musical education, is important, too. As the primary writer, Leonard uses a piano to write and make arrangements. He grew up singing at a piano with his mother and always adds his own twists to songs. The group made a name for themselves in America in the early 1990s shortly after creating the theme song for the PBS hit show, “Where in the World is Carmen San Diego?” They appeared as the show’s vocal house band and resident comedy troupe. Leonard said the experience was a lot of fun, and to this day, they sing the theme song at every show. They also penned the well-known Folgers commercial with the famous catch line, “The best Part of waking up is Folgers in your cup,” a Taco Bell commercial, starred in the television special “Do It A Cappella,” which was hosted by accomplished filmmaker Spike Lee, starred with Whoopi Goldberg and Denzel Washington in the HBO family series “Happily Ever After: Fairy Tales for Every Child,” as well as opened for acts such as Chuck Berry, Styx, Billy Joel, and their a cappella idols The Persuasions. Additionally, they performed on Jay Leno’s first New Year’s Eve episode of “The Tonight Show “in 1992. Since then, they’ve built quite the fan base. “We have fans that have seen over 200 shows apiece,” Leonard said. He’ll most likely see some of those fans within the month: the group recently booked a gig to perform on a cruise from Australia to Bali. He’s also hoping to see them at The Z Feb. 10. “There’s a rumor surprise guests might be opening for Rockapella,” he said. 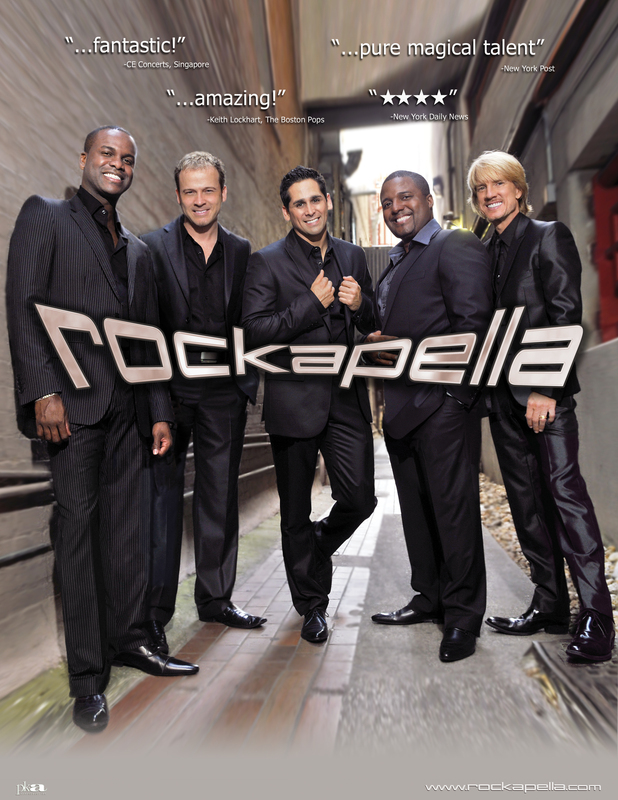 To learn more about the group or to download their music, visit http://www.rockapella.com. The Zeiterion’s box office is located at 684 Purchase Street in New Bedford, Mass. Tickets are priced at $30.50. Box Office Hours: M-F 10 a.m. to 5 pm.., Sat 10 a.m. to 3 p.m. and one hour before each performance. For more information, visit www.zeiterion.org or call 508-994-2900. Editor’s Note: Since this interview, the surprise special guest alluded to by Mr. Leonard is the G-20 Chorus, an award-winning chorus group from Fall River, Mass.